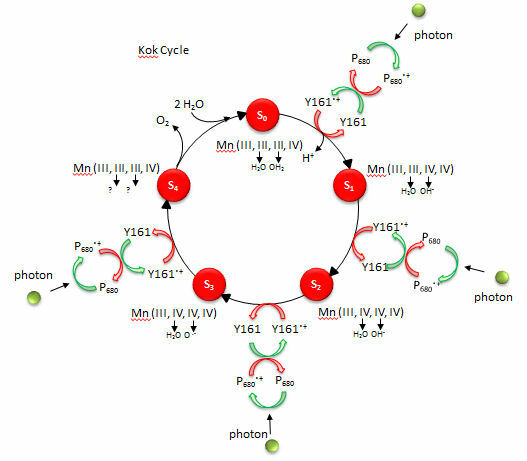 The mechanism by which water is oxidized occurs through a 5 stage Kok cycle illustrated below? The Sn states in the Kok diagram denote different discrete oxidation states where n the number of oxidative “equivalent” stored in the OEC during cycle progression. What happens to Mn ions in the OEC during the cycle? What is required to initiate the next stage of the cycle starting from So? What is the role of Y161.+, an amino acid in PS2 that is very close to the OEC as shown in the figure below? A new mechanism has been proposed based on the recent crystal structure. 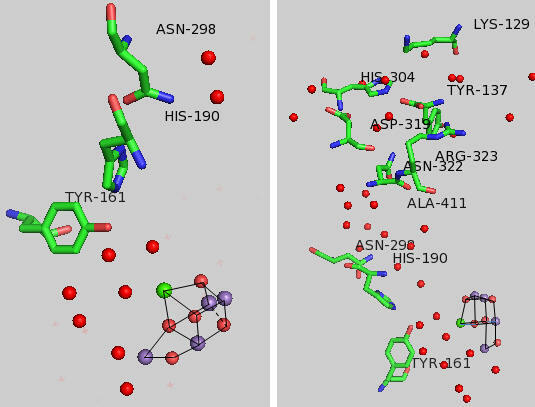 A possible model for S3 is shown below with the distorted cubane structure and with an oxy and oxyl ligands. Add a curved arrow to show how an oxygen-oxygen bond is made. Given the maximal packing of ligands (including water) around the OEC, there must be a way for water to enter the site and for protons that are removed to move away from the complex and toward the lumen where they would contribute to the development of a proton gradient. Tyr 161 is a critical amino acids that is situated proximal both to the OEC and to the source of electrons that reduce water. The figure below shows the immediate environment around Y161 and the OEC. Describe the role of the groups shown in the figure below. 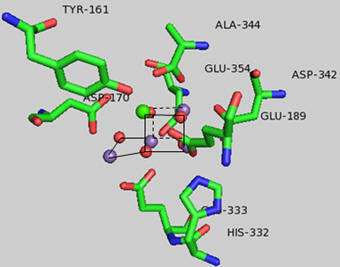 An expanded view of the OEC and part of the protein is shown to the right. Tyr 137 lies near the luminal interface of the protein complex. Describe the figure below and the role of the groups shown.